Phantasmaphile: When did you begin painting, and more specifically, when did you feel you finally had your own voice or vision? Richard A. Kirk: That is a deceptively difficult question. The easy answer is that I have always drawn. At some point though, there is a threshold where it changes from an unconscious, playful activity to something more conscious, where you are focused on developing your technique. At the risk of sounding high flown, in some ways my development as an artist is a journey back to that original state of play or at least finding a balance. The biggest difference between my art production now and say 10 years ago is that I can find what pleases me artistically with a lot more speed and confidence. A lot of that comes from simple experience. Ph: Your site says you were born in England, though you are now a Canadian artist. Did this migration influence your work in any way? RK: That migration was very early in my life. It influenced me in that in my imagination, England was a mythical place. I was more likely to draw Daleks than Superman. I was greatly influenced by English artists, particularly the classic illustrators and the pre-Rapahelite painters. 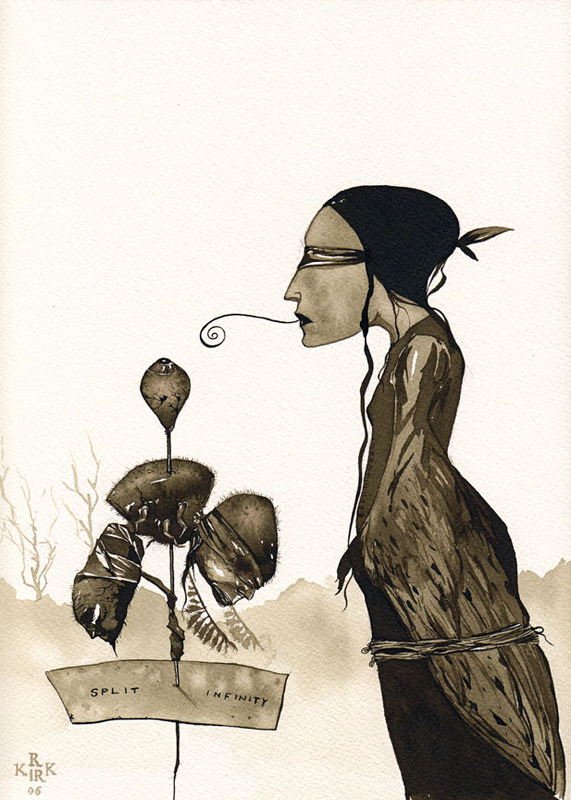 Ph: Your site also says that you have been influenced by children's book illustrations and insects. Which ones in particular (of either) have really left an impression on you? RK: Wow, there are so many. Sidney Sime, E. H. Shepard, Beardsley and Mervyn Peake immediately come to mind. Later on Redon and Max Klinger; Symbolists. Klinger's "A Glove" was a huge influence on my work. I think I was attracted to these artists initially because they worked with an incredible level of creativity with a medium that was readily available to me. They could unleash worlds with a bottle of ink and a pen nib. I've never gotten over the simplicity of that. In terms of insects I must admit an affection for the leaf mantis and paper wasps. Oh yes Rackham, of course, getting back to influences. How could you not love storks with human hands? Like Rackham, I am all about the line. Ph: Generally speaking, where do your ideas come from? And more specifically, does each symbol have rational meaning for you, or is it a more unconscious process? RK: I am interested in liminal things; protean forms. The generation of ideas is both conscious and unconscious. I draw things that I enjoy looking at like birds, insects, trees and books. Over time, I have developed a kind of personal iconography. I try to develop work that tells a story, perhaps not the same story for everyone, but also leaves many questions unanswered. I love mystery in a work of art. Have you read Little, Big by John Crowley? The idea of worlds within worlds interests me very much, like the house Edgewood in the book; a house that inside is many houses. Ph: Can you describe your process, from the seed of an idea to a complete work? RK: I generally work on one image at a time. I come up with a fragment of an image and draw it out. Next I pencil, in detail, what I think will be the key areas of the image. Following that I begin the time consuming process of rendering the image in ink, silverpoint or paint. I always leave some room for last minute inspiration and compositional corrections. Ph: Your work is beautifully meticulous. How long does it take to create an extremely detailed piece such as "The Stolen Key?" RK: With ink and silverpoint about 1 square inch per hour. I am not kidding, it's almost that neat. Ph: You keep mentioning the technique of “silverpoint.” Can you please explain it for those Phantasmaphile readers (such as myself) who may be unfamiliar with it? RK: Silverpoint is a drawing technique where you work on a prepared ground with a wire of silver. The ground is "toothy" (imagine a surface like flat wall paint) and in my case comprised of white gouache on a plate finish archival illustration board. It's possible to get very fine lines which can be built up with cross-hatching. Of course, because it is silver it tarnishes over time, developing a beautiful brownish tone. Ph: How often do you paint, and how do you make time for it? RK: I try to work whenever I can. I've learned to appreciate the value of the cumulative effort. I have a extremely supportive wife! Ph: Who are your favorite artists? RK: There are many - off the top of my head, Eva Hesse, Kiki Smith, The Brothers Quay, Svankmajer, Eric Dinyer, anyone with the last name Wyeth. I could go on forever. Rosamond Purcell. RK: I like to see things in ways that are unexpected. The image that immediately came to mind was a photograph by Rosamond Purcell of an old book with roots growing out of it. I find the indefinable beauty and unexpectedness of that kind of image to be very inspiring. It inspires me to try and create images that make you pause, that make you uneasy or excited in ways you can't quite put your finger on. Ph: Do you have any plans to exhibit here in New York? RK: Yes. Absolutely, but it's nothing I can really talk about yet. Ph: What is your favorite a) taste b) sound c)sight d) smell and e) tactile sensation? RK: Of course these could change in an instant but here goes: a) Indian food, b) wind in trees at night, c) deep water, d) fresh ink, e) old books. Ph: Is there any news or work of yours you'd like me to share with Phantasmaphile's readers? RK: I will be having a couple of pieces of work in the Kunstsalon Berliner in September and the upcoming Arcanum show in NYC in October. Both of these shows are through Strychnin Gallery. I am also working on a cycle of work that I am very excited about which is mostly ink and silverpoint drawing, [as well as] some giclee print portfolios of work done originally for the Drawing the Line comic anthology. The portfolios were created by Luna7.com and all proceeds are going towards cancer research. Interested readers can keep up on general goings on through my blog! RK: No. But saying that made my skin crawl a bit.